If you haven’t seen our new Pro X Series stoves yet, you need to check them out here. It’s okay—we’ll wait. If you have seen them, you might be wondering what the differences are between your trusty, original Pro 60 or Pro 90 from years ago and these new models. The legs and shelves look a little different, but are those the only improvements? Not even close. Let us walk you through the Pro X Series design, and you’ll see just how far we’ve raised the bar. Not every piece of the original Pro design needed to be changed. In fact, there are quite a few classic features you’ll find on most of our stoves, including the new Pro X Series. Why is that? Because if it ain’t broke, don’t fix it. Here are the great features we carried over into our new design. One thing our customers love about our stoves is that they aren’t stoves—they’re stove systems. What we mean, is that you can do much more than grill on one of our stoves. 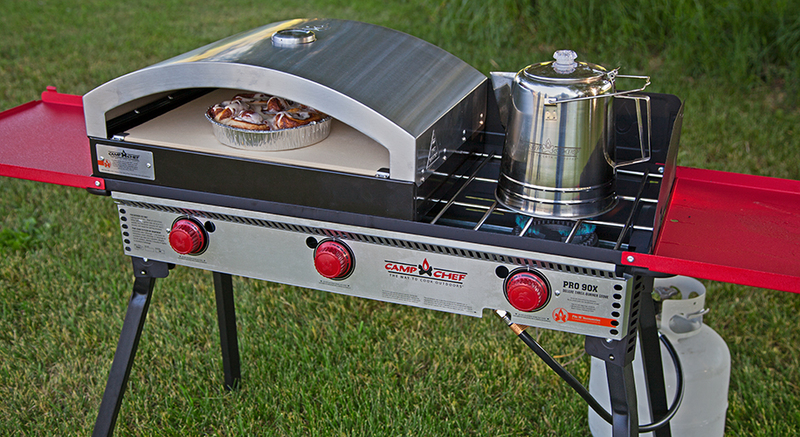 With the right accessories, you can bake pizza, fry bacon, and heat up some hot chocolate all on one unit. For more information about our stove systems, you can look here. Just know that our Pro 60X fits right in with our 14-inch system, and our Pro 90X matches the 16-inch system. The convenient three-sided, folding windscreen is a staple of many of our outdoor stoves. 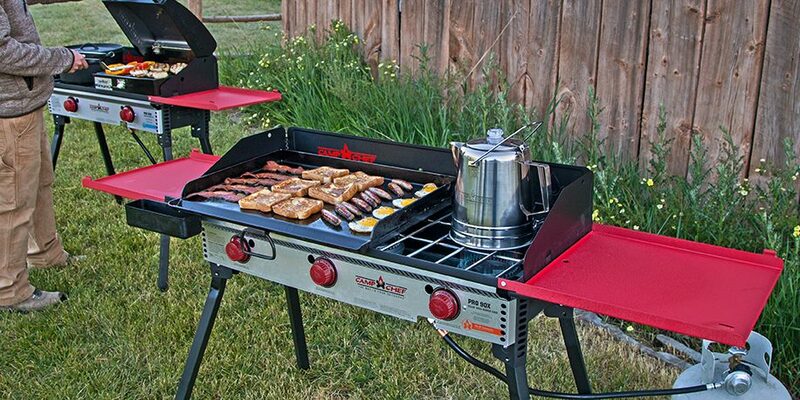 When you cook outside, you have to adapt to the natural conditions of the patio, campsite, or wherever you find yourself. Wind is almost a guarantee. You need a sturdy shield to keep your flames strong in the breeze so your food stays hot. And the Pro X Series brings you exactly that. 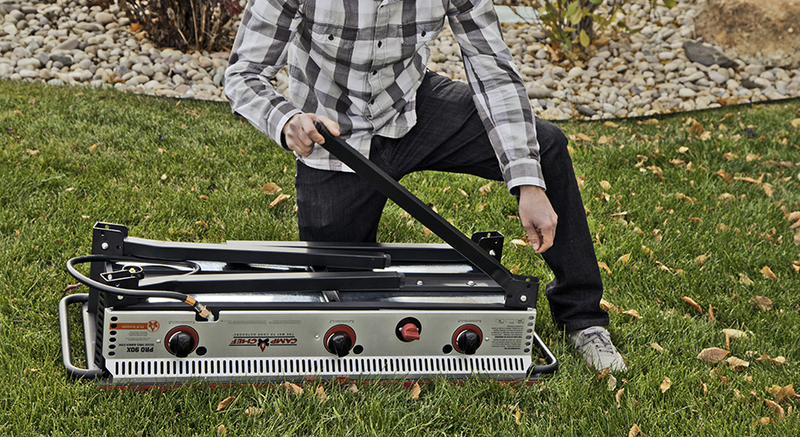 Serious outdoor cooking calls for serious cooking power. We have designed many of our two-burner and three-burner stoves with 30,000 BTU burners to give you all the heat you need for every cooking job. Whether you’re bringing water to a rolling boil or lightly toasting hamburger buns, you can do it with ease. Naturally, you can find that same power packed into the Pro X Series stoves. While we’ve kept some of our very best features, we’ve also reinvented many others. Your feedback over the years helped us design these new stoves to be the most convenient and versatile stoves we’ve ever created. Simply put, they’re the best. Have you ever tried scrambling eggs while your stove is standing at an angle? We don’t suggest it. Cooking on uneven ground can be a pain whether you’re trying to keep from spilling bacon grease or making sure your veggies don’t roll off the side of the grill box. 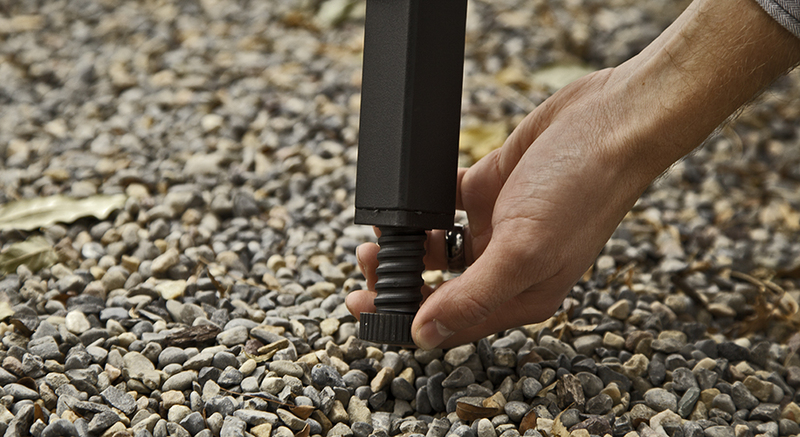 Our optional leg levelers worked well if you wanted to buy an extra accessory for your stove. But with the Pro X Series, we built the legs with levelers already inside. Now you can handle the terrain wherever you go. Matchless ignition is a feature you’ll find on many of our other stoves. However, with the Pro 60X and the Pro 90X, we have built this feature into each knob. That means you can light one burner at a time with individual knobs—and all you have to do is push and turn. No lighters, no two-handed process. Just push in, turn to ignite, and you’re ready to cook. Our side shelves now fold up to cover the top of the stove and down to lie flush with the side. What does that mean for you? When you’re finished with the stove and want to pack up, you can fold the side shelves over the top to fit easily into a carry bag. But if you’d rather leave the stove on your back patio with a pizza oven and BBQ box on top, you can fold the shelves down and fit a patio cover over the entire set-up. The option is yours. Our original Pro Series also featured folding legs. But we’ve taken this design to a whole new level. The Pro X Series legs fold in more smoothly and easily than ever before. You only need to push a button to unlock and fold down. Within seconds, you can have your stove set up or taken down. Forget fumbling and wrestling with your outdoor kitchen. We’ve made it seamless. By now, you can see we’ve truly put our best foot forward with the Pro 60X and Pro 90X. We wanted to give you the best outdoor cooking experience possible, and we’re confident these stoves offer exactly that. So stop making do with “good enough,” and start cooking like a pro. Check out our Pro X Series now. Hey Marvin! Try emailing our support team at [email protected] and they will help you out with your starter knob. I have the “Big Gas Grill”, the plastic “ignitor knob” broke after about 3 uses. Anyway I can get a replacement knob? Warranty replacement? Hey Marc! You can email our support staff at [email protected], and they will help you out with getting a replacement part. Your modifications take me back 20+ years. I’ve owned ten models in my life. Let’s hope your square leg design doesn’t rust through like some of the round ones. The side shelves not only provide great storage while cooking, but keep the leaves and blowing dirt off the orafaces. I have the two Burner stove, I have added a Flame tamer for the burner under my 16 inch Griddle! Added the adjustable legs and have a carrying case for the stove and one for the Griddle! Added the 8 ft gas line and a cover to use while camping! Love it all! I use it weekends for local camping in my fifth wheel!